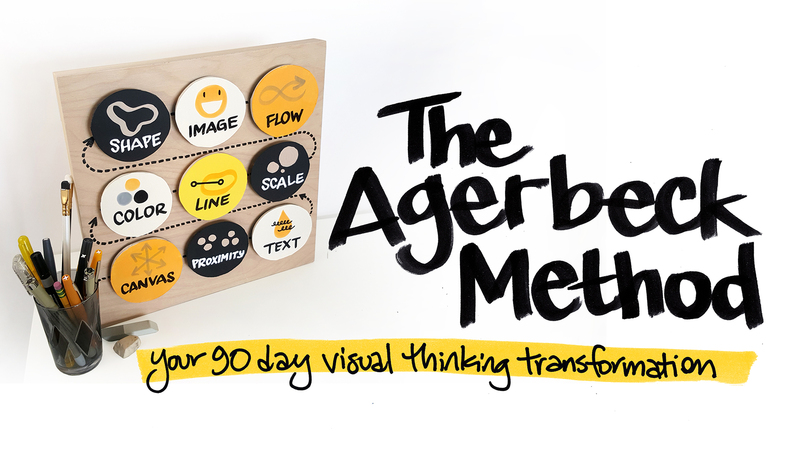 The Agerbeck Method is a 90 day, on-demand, video-based online course to teach you how to use drawing as your best thinking tool. This specific type of drawing — drawing to think through your ideas, to learn, to listen better, to problem solve, to clarify and communicate — is called visual thinking. Our educational systems and workplaces are heavily verbal, auditory and text-based. We were taught to express ourselves through learning the 3 R's: reading, writing and arithmetic. This word-centric approach forces linear thinking: reading, writing and thinking from left to right, from top to bottom. When's the last time you solved a problem in a straight line? Visual thinking is an endlessly adaptable and mighty powerful life skill. It only needs very simple materials: paper and pen. And it is always at your fingertips. BUT it's not the fastest or easiest skill to learn. As our cultures get more and more visual, we are becoming more and more sophisticated as viewers. We can read a lot into the images we see. But those classrooms and workplaces have left us woefully unprepared as makers. Instead, the past primacy of written and spoken words has left us with the unrealistic expectation that we can always express ourselves in words and that we can make them all line up beautifully. And if we don't, we've failed. And pictures? Well, drawing is silly, that's doodling, that's the artsy-fartsy stuff. WRONG. Drawing and visual thinking is actually a really amazing secret weapon to make all sort of incredible work happen. "Within the making of a drawing are countless choices. A power of drawing is in the choices that make a physical drawing. When you use any of the Idea Shapers, you are making physical objects. A drawing. A stack of cards. A giant map. A tiny icon. In your object-making you make a multitude of choices: which pen to use, which color, what surface to draw on, what to draw. When deciding what to draw you will also make many decisions about your content: Does this idea belong in this drawing? How do I phrase it? Is there an image that supports it? What is the placement? Size? Style? Color? How does this one piece relate to the other pieces I've already established on the page? each decision made. Every mark has meaning. With each mark you are making meaning for yourself." Again, drawing and visual thinking is a powerful and endlessly adaptable, but it is also complex. This is why I wrote The Idea Shapers. In it, I share a five-step process that contains 24 visual thinking concepts, called idea shapers. 1 | Those who find the book an indispensable reference; usually those who already have some kind of visual practice. 2 | Others tell me they want to learn these skills the book holds, but they don't know where to start. ★ I created this course to help those in the second category navigate easily through these visual thinking concepts. 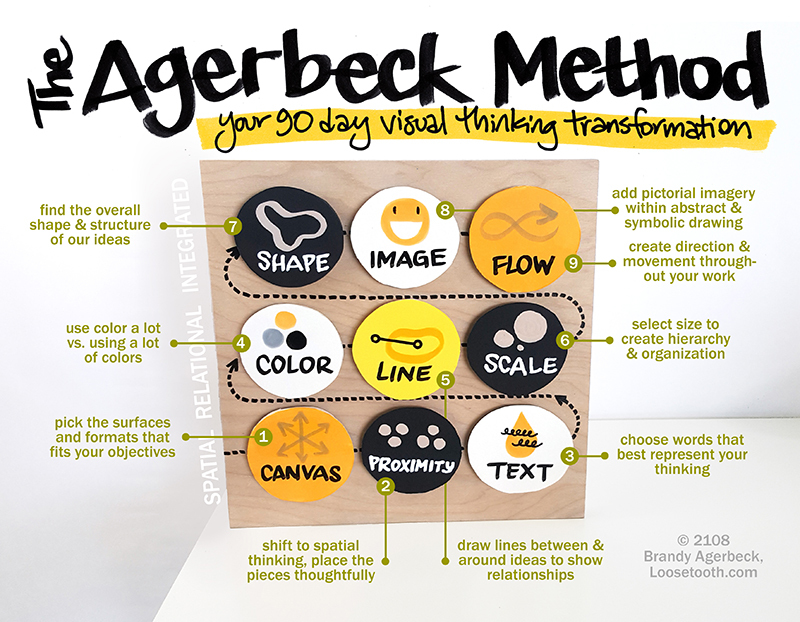 The Agerbeck Method is the first 90 days to your lifelong visual thinking practice. I guide you step-by-step with daily video lessons. This course can do SO MUCH that a book can't do. With video, you can watch me and draw along. You can pause, review, play, re-watch. 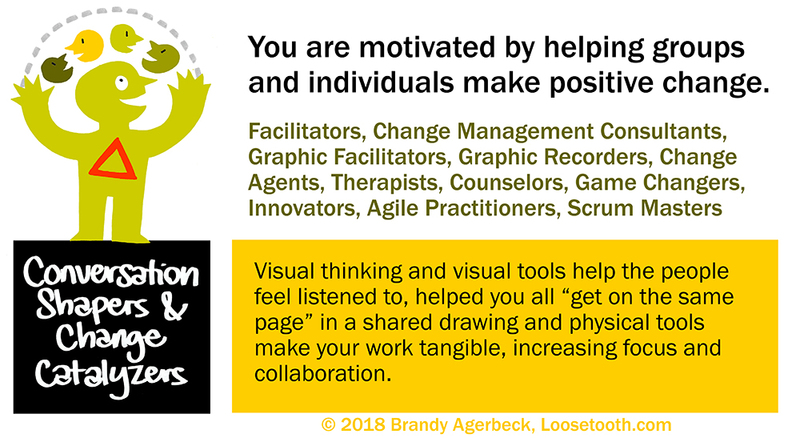 From my studio, I share 90 different, engaging lessons all designed to build up a rock-solid foundation to build your visual thinking practice. And if you already have a practice, you can use The Agerbeck Method to strengthen your practice, increase your focus and discipline and see your work from a new perspective. The Agerbeck Method format is designed around a daily video lesson. Any PDFs or audio files that help deepen the lesson are available for download on each day's page. I give guidance for homework every day, called practice builders. Each lesson is 10-35 minutes. In some lessons, I ask you to join me for a specific exercise. Other days, I invite you to watch, listen and make your own visual notes. I encourage you to spend an additional 15 minutes or so after the video playing and practicing, letting what you learned sink in. Some days, I'll give you a short, specific exercise to complete before the next next day. The secret sauce of The Agerbeck Method is the sequence and the bite-sized lessons. I make sure each "bite" is chewy and tasty and totally digestable. I see each day's lesson as one brick in building your rock-solid foundation. Together, we build brick by brick. I distill a lifetime to of my experience of personal meaning-making with drawing and 20+ years of professional experience as a graphic facilitator to make each one of those bricks as strong as they can be. You fortify that foundation with your time and energy following the course every day. If a 30-minute daily lesson, feels like a lot, you can choose to wait a few days and block out a longer chunk of time on your schedule to do several lessons in one sitting. While a lessons are released on a schedule, the course is entirely self-paced and self-guided. You have lifetime access to the lessons, the files trhe comment sections. There is no deadline. You make the learning work for you. Note: If you do want to learn with friends, I highly recommend taking advantage of the group offers above right - OR - register individually at the same time. This is because the lessons are released timed to begin when you register. I do encourage getting as close to daily practice as possible. Any time you watch a lesson you will learn, and you will be adding to your skill set — but by tackling smaller pieces more often, you'll make these skills more ingrained, more habitual. Whether you think of these as bites or bricks (and I should watch out for mixing my metaphors, that's how we get loose teeth), that's the micro view. The macro view is that our 90 days together covers 9 modules. Each module focuses on one major component of visual thinking, and we spend 10 days on each. Each module contains 3 topics, each topic is made of three lessons. Days 1, 2, 3 are the first topic, Days 4, 5, 6 are the second topic, Days 7, 8, 9 are the third topic. The tenth day of each topic is a Review + Reflection session. The 1st month we cover the bottom row, SPATIAL, where you shift your thinking from linear to spatial. The 2nd month is RELATIONAL, adding more nuanced visual choices that represent different relationships between ideas within our drawings. The 3rd month is INTEGRATED, getting even more sophisticated in our drawings. This top row is what makes the most of my students seek me out - a sense of whole composition, integrated elements, finding the shape in your drawing, and creating movement and flow. Are you a Big Picture Thinker, but you don’t know how to get these mental pictures OUT of your head and INTO the world? Have you always been a hands-on learner, but wonder how to use that ability to make your life easier? 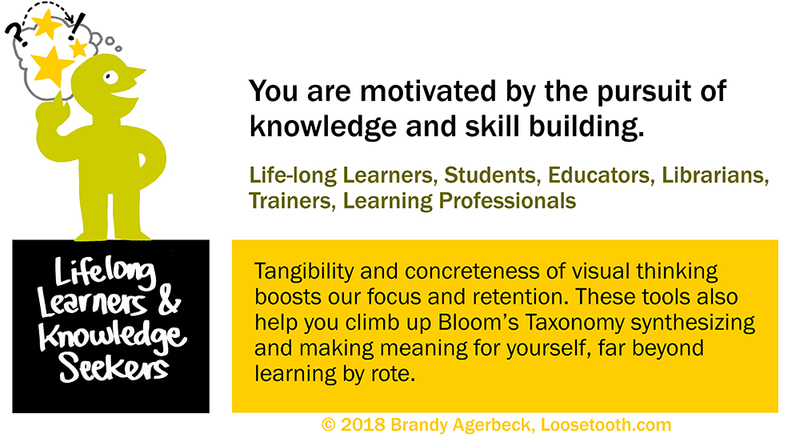 Do you have a voracious appetite for learning, but your challenge is making the learning stick? Or you hate “old school” methods of learning by rote, and you seek new tools? Are you working with a group of people? And you know if you could get them "all on the same page," you could change the conversation and make lasting change. 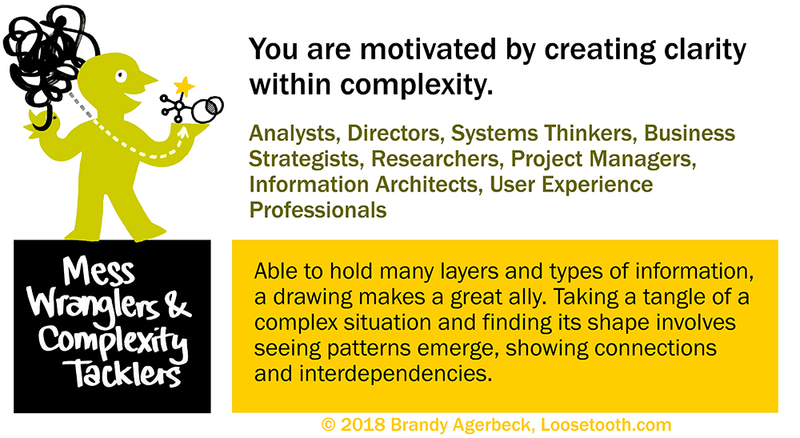 Maybe you have to wrestle with a whole lot of complexity, be it a deluge of information, a huge project with a lot of moving part or a big team with a lot of responsibilities. Simplifying doesn't work because it only shows you one part of the whole picture. You want to get your message out into the world, but right now it's all passion and energy, and it's messy. 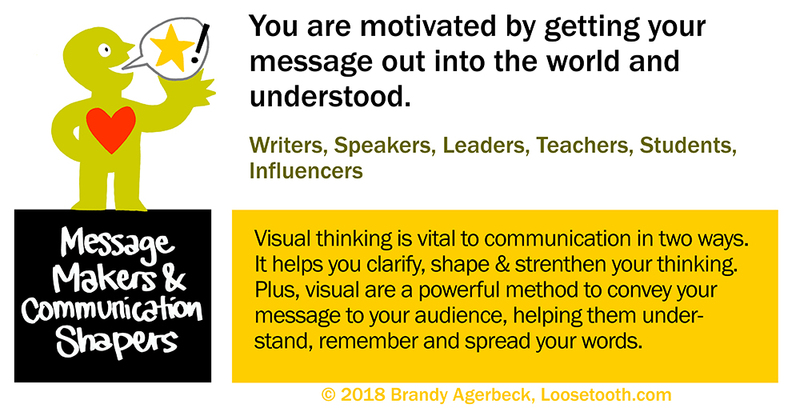 Do you struggle with finding the shape and structure of your message? Do you have a professional listening role? If you could show someone what they are saying, you could help them see their issue from a new perspective. Do you feel fuzzy or foggy with where you are in your life right now? No you yearn for reflection and the better picture where you are right now? Would you like to envision your future? Even draw out the path to get from here to there? Are you simply feeling overwhelmed? Looking for tools to reduce that stress and create more clarity for yourself? Visual thinking is a 🏆top notch tool 🏆for facing ALL of these challenges. After creating learning paths for each of these 5 types of visual thinkers (which is my long-term work, I realized that much like the book The Idea Shapers, there was core course in common for all five types. That is The Agerbeck Method. This course is the foundation of your practice, no matter what kind of visual thinking home you build on top of it. Q: What do I need to access the course? A: The core of each lesson is a video that you watch from your browser. You log into your account at courses.loosetooth.com click into The Agerbeck Method. This learning platform is optimized both for computer viewing and watching from your phone. As long as you can stream these short videos and you have paper and pen, you are good to go. Occassionally, I add supplemental PDFs or audio files to the course. An ability to print the PDFs is useful, but not crucial to your success. A: You have lifetime access. As long as I have this learning platform up, you have access to The Agerbeck Method. I know technology changes, but this is my long-term home for my online courses. Q: What's the deal with all the pricing options over to the right? A: Good question! I talk about this towards the end of the video. Learning with a buddy or a small group, can do so much for helping you focus, retain what you learn, make meaning of your experience, all by sharing it with others. This "social learning" is encouraged with the pricing options for groups of 2 to 4 people. The Buddy System is also a great way to give The Agerbeck Method as a gift! Q: How does payment on the group registrations work? A: One person registers and when they do, the enter the names and emails of the other members. The primary person is instantly in the course. The others are adding manually by Brandy and will receive emails that they are added. You coordinate payment among yourselves. If you have questions about registration or if this course is right for you, please contact me directly. If you have questions within the course, every lesson has a comment section where you can ask questions. I can answer short, specific questions there. If you have more in-depth questions, I recommend subscribing to the monthly Q&A call, which will be offered on checkout. If you want one-on-one coaching, reach out to me for availability and rates. Q: What if I find that the course isn't meeting my needs? A: I offer a 30-day, "no-quibble" guarantee. Just contact me and let me know within 30 days of registering. I'll revoke your access to the course and refund you fully. Upon checkout, you'll add your buddy's name and email for registration. Upon checkout, you'll add the names and emails of your friends. Your 90 day visual thinking transformation. Click here for the 3-payment plan. You'll be charged $217.00 today. A second automatic payment of $217.00 will occur 30 days from now. Your final automatic payment of $217.00 will occur 60 days from now. The Agerbeck Method x 4 | Four for the Win! Upon checkout, you'll add your friends' names and emails to register them.